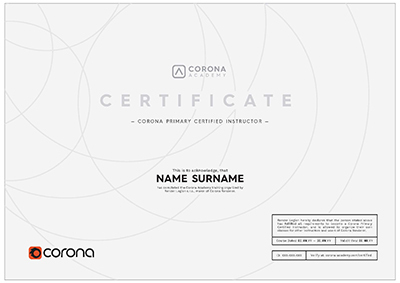 All those who successfully complete the Corona Academy will become Primary Certified Instructors, able to organize and charge for their own authorized “Corona Renderer Educational Courses” and certify other instructors, schools and regular users. 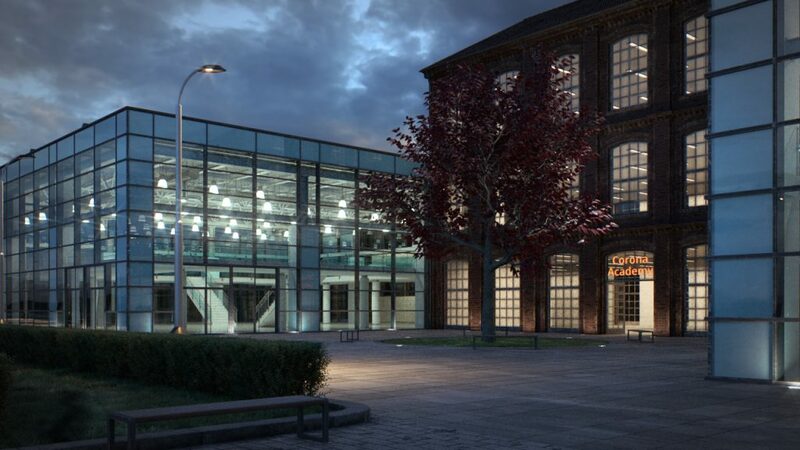 Learn how to set up this exterior scene to render efficiently with many lights. High level of familiarity with 3ds Max. High level of familiarity with Corona Renderer. Explore common causes of noise and solutions during the course. All those who successfully complete Corona Academy will become Primary Certified Instructors, able to organize and charge for their own authorized “Corona Renderer Educational Courses” for Corona Renderer users, who will get the status of Certified Users. However, Primary Certified Instructors will also be able to organize and charge for “Corona Renderer Educational Courses” for attendees who will become Certified Instructors. Only Primary Certified Instructors can run courses that give Certified Instructor status, because only Primary Certified Instructors will gain training directly from Corona Academy. Certified Instructors can organize and charge for their own authorized “Corona Renderer Educational Courses” for other Corona Renderer users, and all those who pass these courses will become Certified Users. One Corona Renderer license for the duration of their certification, free of charge – which means one free full FairSaaS license for 2 years. Corona Renderer licenses for their students to use during their courses, free of charge. 10% discounts on a yearly license for their Certified Users. Promotion on our Corona Academy webpage, which will include promotion of contact details and certification details in our list of Primary Certified Instructors, Certified Instructors and Certified Users, and promotion of all upcoming “Corona Renderer Educational Courses” organized by Primary Certified Instructors and Certified Instructors. Access to the latest electronic versions of the Corona Academy educational materials, to keep up to date with revisions and changes, so that the materials stay in line as Corona Renderer develops. Certification as an instructor is valid for 2 years, and would then need to be renewed – this is to ensure that all Primary Certified Instructors and Certified Instructors are professionals who have kept fully up-to-date with all changes in Corona Renderer. All levels of Certified Instructors will pay a 10% share from revenues derived from their courses to Render Legion. Being certified will bring many advantages. The Corona Academy is focused on the educational training of tutors and power users only. We would like the top level Corona Renderer instructors be the ones who organize “Corona Renderer Educational Courses” for beginning, average and advanced users – structuring the training in this way will ensure that users from all around the world can have access to courses in their native language, from locally based instructors in their respective countries. It also means that users can be sure that any courses they take from Primary Certified Instructors and Certified Instructors will have the most accurate and up-to-date information on Corona Renderer. In the future, we may also organize a Corona Academy directly for beginning, average or advanced users, if there is enough interest in the initial Corona Academy program. The first Corona Academy will take place in our development offices in Prague city center, on the weekend of November 26th to 27th 2016, and will run from 9:00 to 18:00 on those two days. 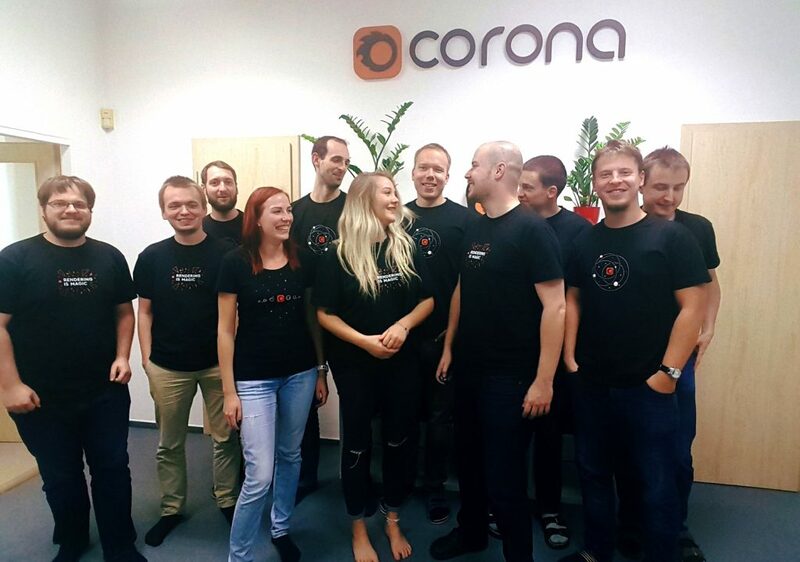 The first Corona Academy will take place in our offices in Prague. 849 EUR (+ VAT If applicable) for the 2 day course. The website, with applications page, will be launched soon. The website will also show the up-to-date list of all certified instructors and users with their contact details, plus any upcoming courses organized by all levels of Certified Instructors. The capacity of each Corona Academy course is limited. For the first Corona Academy in Prague, this is limited to only 10 attendees. The first Corona Academy is already sold out! For those who wanted to attend but could not get a place this time, we plan to organize the second Corona Academy sometime around March 2017 and will let you know when that is scheduled and the date is fixed. There will also be other Corona Academy dates set next year. If you have any questions about Corona Academy, please contact us at academy@corona-renderer.com. Hi Mahmoud, currently we are not planning any online courses. They will be arranged in our office in Prague, and in some other places around the world in the future, so that travel would not be very long for anyone. There are no other countries for our Corona Academy courses in the foreseeable future – however, you can find courses by official instructors (and filter by country to find one nearby) at https://corona-academy.com/certified. I am very interested in the coronarender certification training. If I understand correctly, afterwards I can train my own customers, create my own material and only 10% of this income will flow back to renderlegion. I am quite the technical render artist and problem solver at work so technical in depth is a must! I am fairly new to coronarender however last year I attended the soa academy masterclass, I am familiar with Arnold, vray, mentalray, stellar and renderman. I believe to have a fair enough understanding of rendering principles, 3ds max and shading to participate. Hi Per, yes, you understand our rules correctly. Glad you like the idea. 🙂 If you are familiar with other renderers and 3ds Max in general, then I don’t think it’s possible that you will find Corona hard to learn. It’s actually much easier than most renderers out there. I would suggest you taking a look at our learning materials such as video tutorials (https://www.youtube.com/coronarenderer) and then deciding whether you wish to attend Corona Academy, or maybe wait a little to gain more general Corona knowledge that would make you feel more certain about your future plans. Imposible to travel to your country. I am quit eager to get certified and give trainings. Of course your suggestion makes a lot of sense as well. Doing all the tutos and then go for certification. Depends a bit. How many times per year will these classes take place? If not much, then I would prefer to start the 26th Nov already. Unless you really don’t advise to jump on so soon. im omid from iran.as you may now there is no simple way for traveling to your country for people like me.but im guy with 15 years of experience with vray and after your first official release i changed my path…any way online course needed for us plz put it on plan. I’m an authorized Autodesk 3D Max / Revit / AutoCAD trainer in South Africa who is very keen for this course! I’m also ready to fly to Prague for this certification. I’ve been training / lecturing for 13 years. Put me down and sign me up for the next one. Where can I get details. I’m from Haiti. I’m very interested by this program. I would like to take this course but I cannot travel to your country. Can you plan a second corona Academy in the US ? It should be a good place for me and lot of people. Keep me posted for the future training. it will be difficult for most interested applicants to travel to prague. time and money. i suggest the online training option to be made available as soon as possible so we can atleast save our transportation fare for the payment of the classes 🙂 we would gladly pay this way. I’m very interested in Corona training course, I live in Costa Rica and i’m willing to reach Czech Republic to take this course. Please send me all the information about price, dates, etc….in order to planning my trip. When will be next corona courses ? Please start offering online courses. If you have any problems or need advice, you can write an email to support@corona-renderer.com or send a new support ticket ( https://coronarenderer.freshdesk.com/support/tickets/new ) and we will do our best to help you. I am very interested in the corona render .give me a advise to improve my work.. I am already working in vray..
Hello! There are the free learning tools on our YouTube channel and helpdesk pages – to go beyond that, the Corona Academy website lists all courses by us (in Prague) and by certified instructors in other parts of the world on the home page (https://corona-academy.com/) – you can also search for official instructors near you and filter by country on the pages at https://corona-academy.com/certified and then contact them to see if they have plans to organize a course. Thanks!